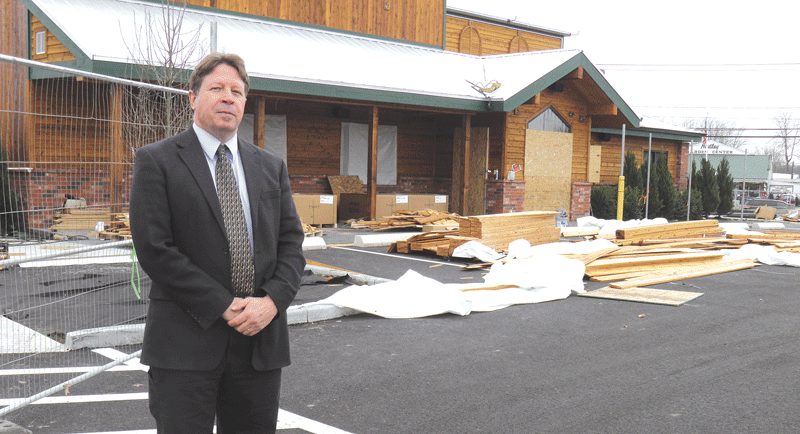 David Nixon says Texas Roadhouse expects to open soon on Route 9, one of several new businesses that went through with their plans even after a moratorium on new natural-gas hookups. Officials in Hadley recently met with a developer to go over some technical zoning issues for a new retail establishment he hopes to build in town. 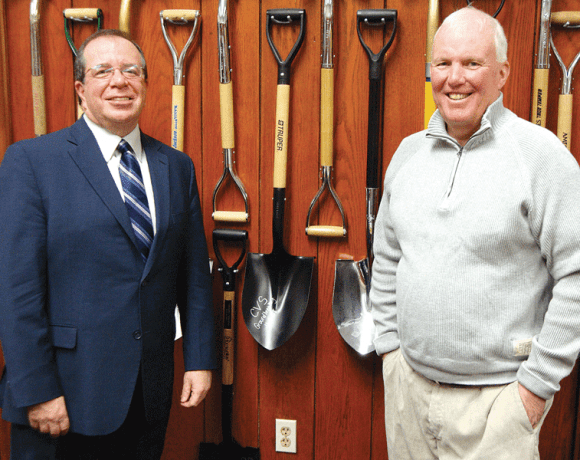 Town Administrator David Nixon said it’s one of many projects that are underway or on the drawing board, and a combination of factors make Hadley a great place for a business to grow and flourish. However, last spring Berkshire Gas issued a moratorium on new or expanded service in Hampshire and Franklin counties due to a lack of pipeline capacity, which led town officials to become concerned that the decision would impact economic-development potential, not to mention a number of projects that had been started but were not complete. Nixon said he took a proactive stance and voiced his concerns when he met with Berkshire Gas representatives as well as state Rep. John Scibak, chair of the Joint Committee on Labor and Workforce Development, and state Sen. Stanley Rosenberg to talk about possible consequences of the moratorium. Indeed, Bob Bolduc said the lack of the energy source did not hinder progress on a new, $6 million Super Pride station and 6,000-square-foot convenience store being built on Route 9 that can be seen immediately upon crossing the Calvin Coolidge Bridge into Hadley. “Route 9 has a high traffic count, and the visibility of the site is excellent,” Bolduc said, explaining that Pride accumulated 4.5 acres of the choice property over a period of several years and nine structures, including the former Aqua Vitae restaurant and several houses being demolished to make way for the new facility that will occupy two acres. “Although we were disappointed that we couldn’t have natural gas, a large propane tank will be satisfactory because it’s what we have in Southwick, Belchertown, and Palmer,” he noted. Other commercial construction projects that have moved forward since the moratorium include a new, 7,163-square-foot Texas Roadhouse which is nearly finished; a 6,192-square-foot Advanced Auto Parts store; a new, 10,000-square-foot mall containing five storefronts that will be known as Mill Valley Commons, which is expected to open in February or March; and American River Nutrition, a manufacturing firm that makes vitamin E and is building a 24,192-square-foot plant on Venture Way, expected to open sometime in the near future. “They had all planned to heat with natural gas, but switched to propane,” said Building Commissioner Tim Neyhart, explaining that piping designed for natural gas has been modified accordingly. Development of East Street Commons, which consists of 32 new, affordable, and energy-efficient single-story homes for people 55 and older, was also affected by the moratorium. “They had to decide whether to continue building, and it drastically slowed down the project because the developer has to change every unit,” Neyhart said, adding that natural gas pipes do exist on East Street, and if the moratorium is lifted, people could tie into them in the future. For this, the latest installment in its Community Spotlight series, BusinessWest looks at how neither the natural-gas moratorium nor anything else has failed to slow the pace of progress in this farming community turned retail mecca situated strategically between Northampton and Amherst. Bolduc told BusinessWest that navigating the state permitting process for his project has taken took two years and cost $200,000, which is typical for a new gas station on a state highway because a bevy of environmental and traffic studies must be undertaken to ensure the facility won’t affect endangered plants, endangered species, or their natural habitats. But it is finally complete, and although construction will not begin until spring, when it is complete, the new Pride complex will be among the largest in the region, with a drive-up window for coffee and a Subway restaurant with a seating area inside. The Pride complex is one of many initiatives underway or in the planning stages, said Nixon, adding that the town is taking a proactive stance to reduce energy costs and officials are supporting projects related to alternative energy. They include a new solar farm on Mill River Road built by Nexamp that is expected to be operational by the end of the month. He said the town offered Nexamp the option of making payments in lieu of taxes over a period of 20 years, which will increase by about 2% annually. “It helps everyone avoid a roller-coaster ride. If we collected taxes right away, we would get a lot of money up front before they started making much, but as their property and equipment depreciated, we would get a lot less,” Nixon explained, adding that another solar farm that was completed by Nexamp about two years ago subsidizes 70% of the town’s municipal power at a 21% discount and Nexamp has agreed to subsidize the remaining 30% at a 16% discount. “The town spends $225,000 annually on electricity, so it will be a significant savings,” he noted. In addition, Hampshire College plans to build a solar farm in Hadley to power its buildings, and town officials are working out a pilot agreement with the institution. “We also partnered with the Hampshire Council of Governments and were able to get a three-year extension on a fixed rate for municipal electricity. So we are looking at a stable cost that will be discounted by the two solar farms, above and beyond any conservation measures we take,” Nixon continued. In other news, the Municipal Building Committee is working to renovate old structures, and progress has been made on that front. Asbestos flooring in Town Hall was removed and replaced during the summer, and lighting in the building was improved. Nixon said Town Hall operations were moved to the public-safety complex during the six weeks it took to complete the project. There are also plans to install new front doors on the facility and new roofs on the three buildings — the senior center, public-safety complex, and garage used by the Department of Public Works — which is all being paid for with local funding. And although cutting costs, making improvements to municipal buildings, and fostering economic growth is important, Hadley has no plans to ignore its agricultural history. In fact, the town recently implemented a Farmland Preservation Agreement, and is working to transfer property-development rights to preserve farmland that is put up for sale. Hadley is doing well in terms of economic growth, and the prospects for more in the year ahead look good. The town’s master plan is being updated, and surveys, focus groups, and public hearings have been held to get public input. “It should be completed in another year and will have a lot to say about housing, zoning, roads, population, and land preservation,” Nixon noted. Which will all add up to change that officials believe will make Hadley an even more vibrant town in the years to come.